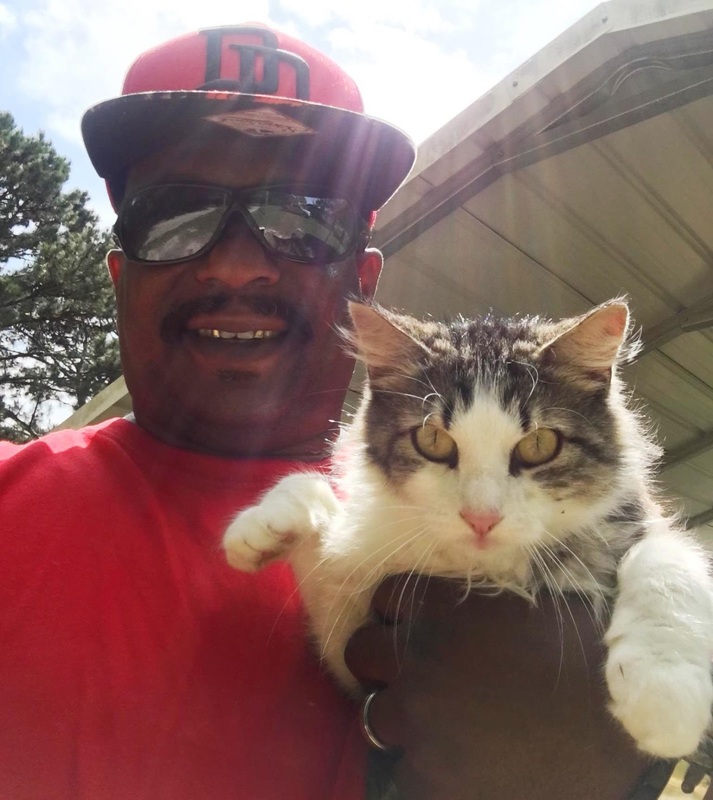 Mike is a Desert Storm veteran who lives in rural Mississippi with his wife and a few cats and dogs. One of his dogs playfully chased one of his cats, Miss Kitty, up a tree, and Mike was hoping that Miss Kitty would find her way back down on her own. As it became more clear that Miss Kitty did not know how to go down, Mike became more concerned. He cares very much for his pets as well as all animals, and his concern quickly grew into distress. Mike tried everything he knew to help Miss Kitty down, and when that failed, he tried to find someone to help him. 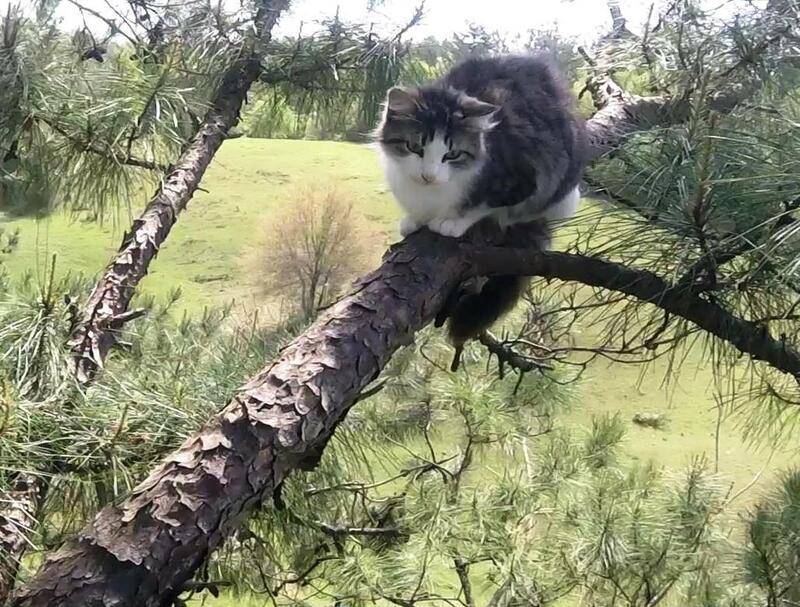 That is when Mike experienced what most people experience when they try to find someone to rescue a cat out of tree. Everyone either laughs, doesn't take it seriously, or gives a pat on the back with glib reassurance usually combined with bad advice. 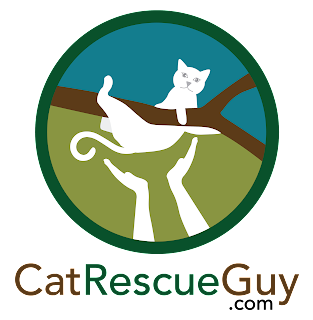 Mike searched the internet for help and found Bob Reese, the esteemed cat rescuer of Mississippi and friend of mine. Mike saw that Bob was located in Starkville and knew that was too far away for him to go, but in desperation, he called anyway. It would have been a four-hour drive for Bob to go there, but Bob referred him to me since I was much closer. Mike called me, and we made a plan to meet there the following morning which would be after Miss Kitty's third night in the tree. After I arrived and met Mike, he led me to the back part of his property. We had to cross a barb-wire fence, and he kindly held the wires apart as I bent over and stepped through. 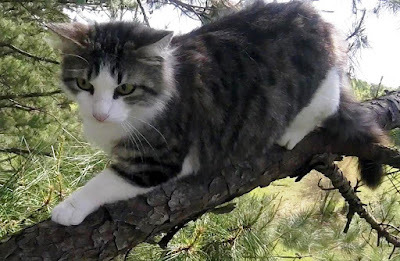 After a few more steps, he pointed up to one of the pine trees that was growing there. Miss Kitty was in one of the smaller pine trees, and it leaned a bit. She had been higher in the tree, but overnight somehow managed to come down a bit. She was now about 35 feet high on the largest and most comfortable branch. Since there were no good limbs above her to use to install my rope, I decided to set my rope well below her and work my way up to her from there. 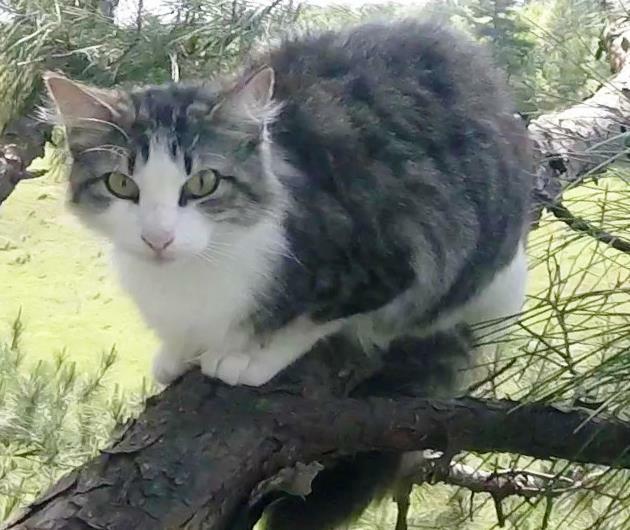 As I climbed up to her, Miss Kitty decided to play it safe and walk out on her limb a bit to put some distance between us. She did not appear to be alarmed at all, but she was being cautious until I proved myself to be friendly. When I reached her branch, she stayed in place and spoke to me while I reached my hand out to her. At first, she appeared to be afraid of me and started to back up slightly. I pulled my hand back and talked to her some more, and she settled back down. I prepared the gloved bag on my hand, since I thought I would be able to make friends with her eventually. I reached my hand out to her again, and this time I touched her. She allowed it without reaction. I kept building on that by pulling back and then petting her some more. Eventually, she became convinced that I was friendly, and she relaxed and took a couple of steps toward me. Again, I petted her and massaged her scruff. I grabbed her scruff, picked her up and pulled the bag over her. Her voice changed to one of serious betrayal, but she was safely in the bag. I brought her down and handed her to Mike. Mike took her back toward the house and released her and fed her. Mike was one of the most relieved and grateful of any of the cat owners I have ever seen. He had suffered these past three days as he worried about his cat and endured the frustrating ordeal of trying to find someone to help. It was such a relief to him not only to find someone who cared, but who also could safely bring his cat back down into his arms. It was very clear that a huge weight had been lifted off his shoulders. He had not been sleeping well these past three nights as he worried about Miss Kitty. Hopefully, he and Miss Kitty both can sleep better now. Thank you, Mike. Your clear relief and gratitude make it all that much more rewarding and enjoyable for me.